Have you ever seen so many gulls? What do you suppose it is? "If you have ever eaten a turkey drumstick, caged a canary or gone duck hunting, The Birds will give you something to think about," drawled the voice of Alfred Hitchcock. It was 1962 and this was a radio advertisement for the film, a clever spot designed to intrigue and titillate audiences while implicating them in the director's latest horrific tale. Hitchcock was by this point a household name, his films Notorious, Rope, Strangers on a Train, Dial M For Murder, Rear Window, Vertigo, Psycho, and dozens more already behind him. 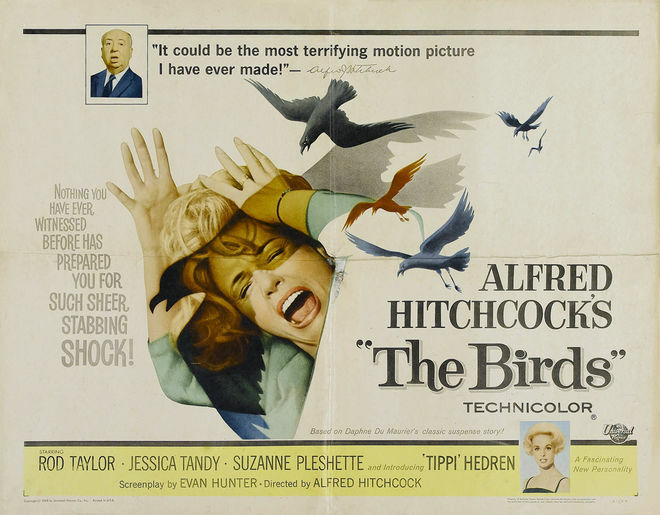 When The Birds was released in 1963 it was a technical as well as aesthetic marvel, combining live action, composite photography, animation, and mechanical as well as live trained birds to produce a whopping 1,400 shots – more than twice the usual number for a feature film. 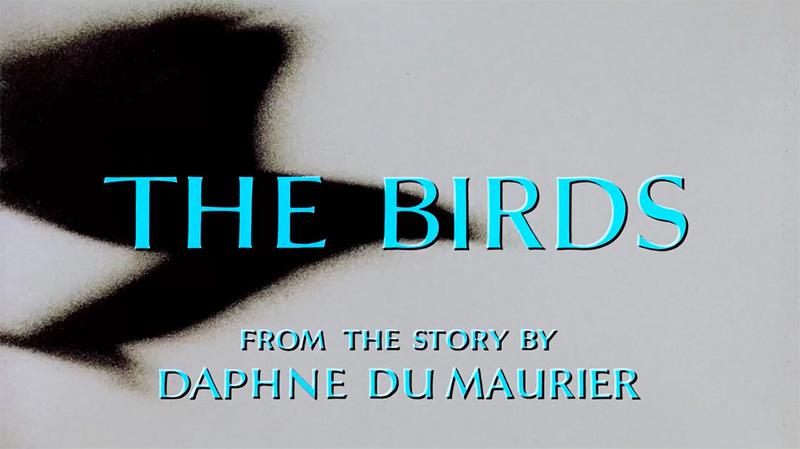 Based on the story of the same name by Daphne Du Maurier, The Birds is a taut picture with moments of delightful comedy and abject horror. It occurs over a long weekend in Bodega Bay, California, spanning a five-day period from Thursday to Monday. It is also at heart an apocalypse movie, the world becoming overrun by crazed, winged beasts in a matter of days, the characters left dead and damaged, the cause left terrifyingly unexplained. Hitchcock classifies the film as a "catastrophe" picture, saying that the characters "were the victims of Judgement Day". Italian filmmaker Federico Fellini called the film an "apocalyptic poem". Its opening stanza – its title sequence – is a powerful primer for the harrowing narrative and its shocking peaks, still 40 minutes away. The credits, executed in the blue of a perfect clear sky, are torn to pieces as if pecked apart. 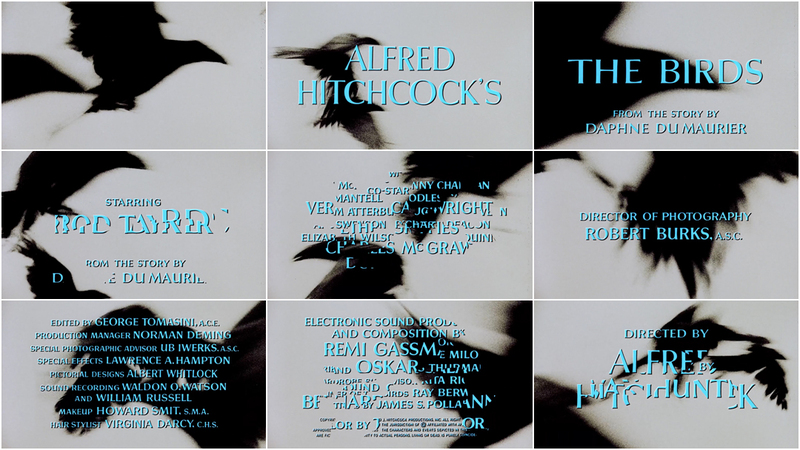 On September 14th, 1962, a memo was sent by Peggy Robertson to James S. Pollak at National Screen Service Corporation (NSS), an advertising, post-production and distribution company, requesting a title sequence for The Birds. 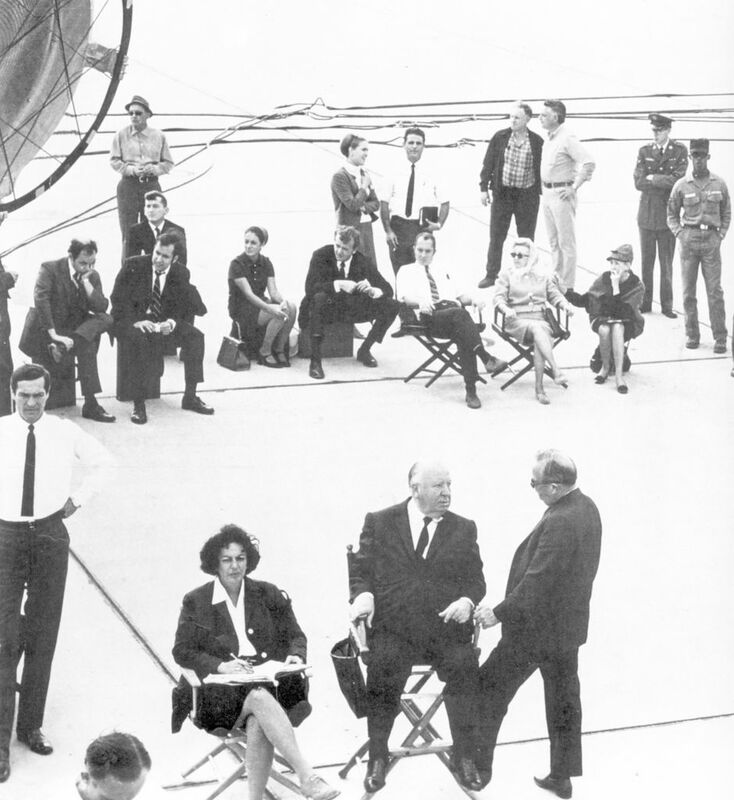 Photograph from the set of Topaz (1969), with Peggy Robertson and Alfred Hitchcock seated at bottom. Hitchcock is speaking with producer Herbert Coleman. Robertson was Hitchcock's personal assistant and right hand through many of his major works. Initially hired as the script supervisor for 1949's Under Capricorn, Robertson later became Hitchcock's production assistant, working as his de facto associate producer (though never credited as such) for 30 years. At the time, Pollak was a designer employed with NSS. In 1960, he had assisted on the opening to Spartacus, providing advice to Stan Margulies, then a production aide earning his first film credit. In 1963 Pollak collaborated with designer Richard Kuhn on the opening to The Wheeler Dealers, a romantic comedy with a vibrantly colourful and boisterous opening. Pollak's work that same year for The Birds is another beast altogether. The film's title sequence is a cacophony of consonance, all shrieks and screams, flutters and flaps; a rush of mechanical bird noises scraping roughly through sheer space. The birds are black smudges, both shadow and substance moving in and out of frame. They flash across a white void, their sounds overwhelming and menacing. The credits, executed in the blue of a perfect clear sky, are torn to pieces as if pecked apart. The text is destroyed, shattered like the teacups that appear later in both the Brenner living room and the Fawcett kitchen – stark symbols of human civilization being cut down. The titles show a war between nature and culture, with the irrational and the primitive vanquishing human illusions. 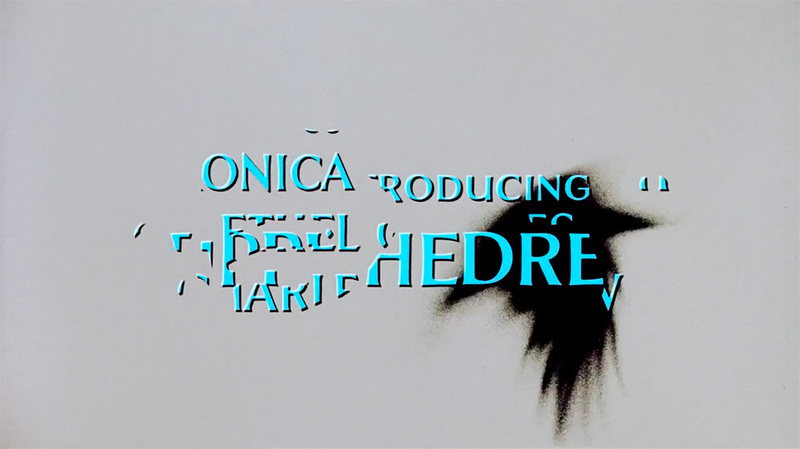 Camille Paglia, professor, cultural critic, and the writer of The Birds, a monograph commissioned by the British Film Institute in 1998, describes the title sequence as "an avant-garde fantasia in and of itself. Against cold, white, abstract space, black crows flutter back and forth, out of focus as if seen alarmingly too close. [...] Against the severity of deep black and blazing white, the titles' very formal, slightly raised classical letters come up in cerulean blue — the lovely pastel of Renoir idylls and romantic hope, of the welcoming robe of merciful Mother Mary, and of the serene, cloudless sky that Hitchcock denies to Bodega Bay. But the hanging words and names nervously overlap and disintegrate, as if bitten to pieces by invisible beaks. The titles show a war between nature and culture, with the irrational and the primitive vanquishing human illusions." 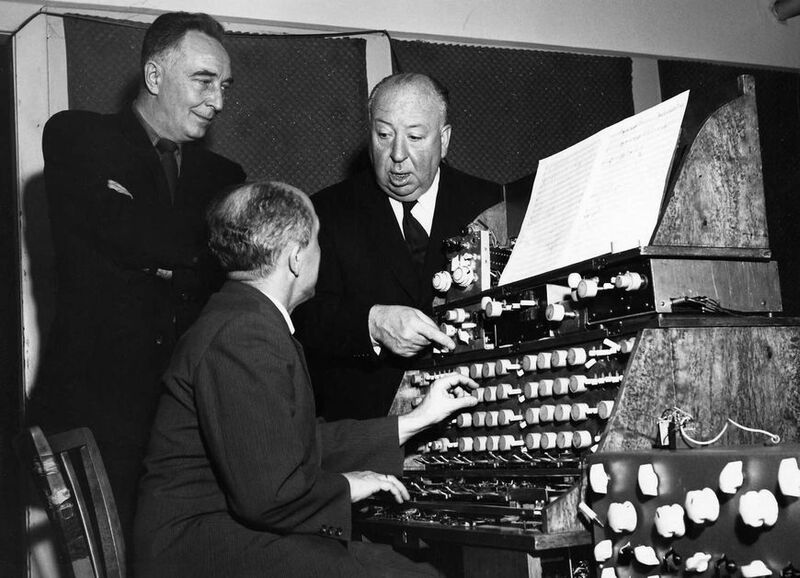 The shrieking black-and-white birds was not initially how Hitchcock aimed to open his film, however. 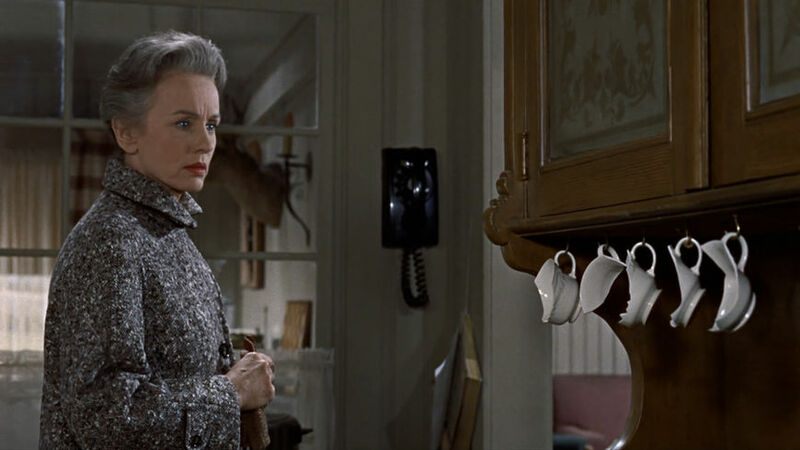 Originally The Birds was meant to open with an entirely different tone: one that was more in line with the film's breezy introductory scenes. The first half hour is light and romantic fare – a calm before the storm. Hitchcock says, "I deliberately started off with light, ordinary, inconsequential behavior." His initial impulse was for the title sequence to match this tone. He says, "I wanted to use very light, simple Chinese paintings of birds — delicate little drawings." But he soon decided that he needed to change "the nature of the opening titles, making them ominous. [...] I felt people might get impatient, having seen the advertising campaign and ask, "When are the birds coming on?" 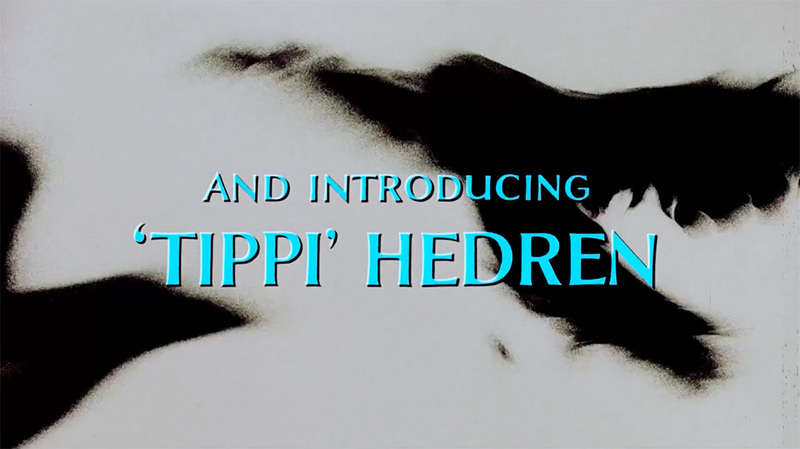 Viewers needed a spot of tension, a bit of the primal vengeance that was promised, so it was decided the title sequence would provide a contrast to the first scenes instead of a complement. 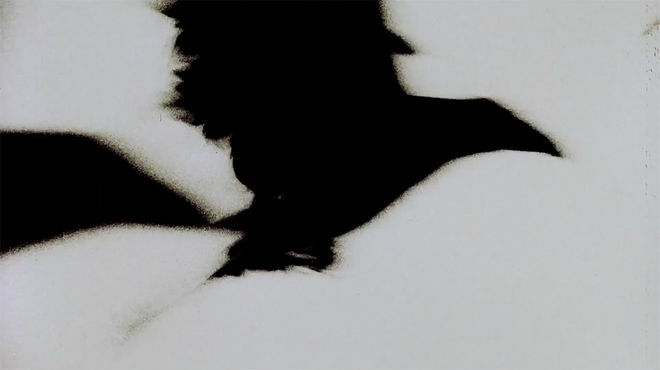 Time Magazine called the title sequence a hint "at the ornithophobic horror to come" and it's a technique that has been used by filmmakers the world over. Director David Fincher, while working on Se7en (1995), realized that the opening to his film "lacked the feeling of John Doe, the villain" and that audiences "needed a sense of what these guys were up against." 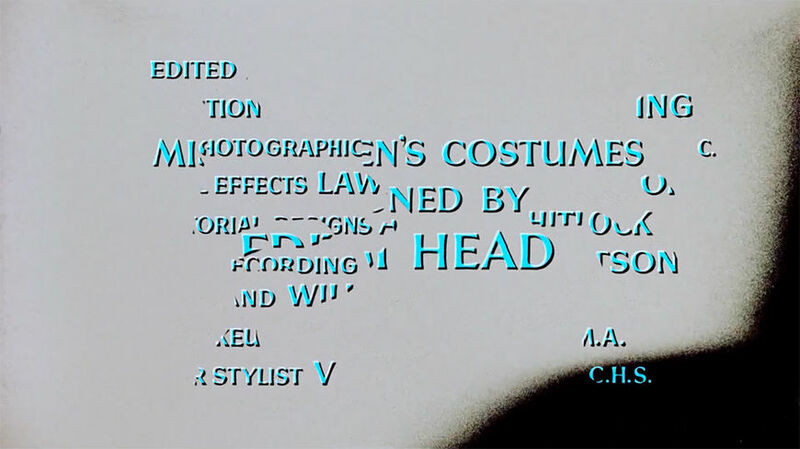 As in The Birds, the title sequence was used to provide that sense – a taste of the madness to come. 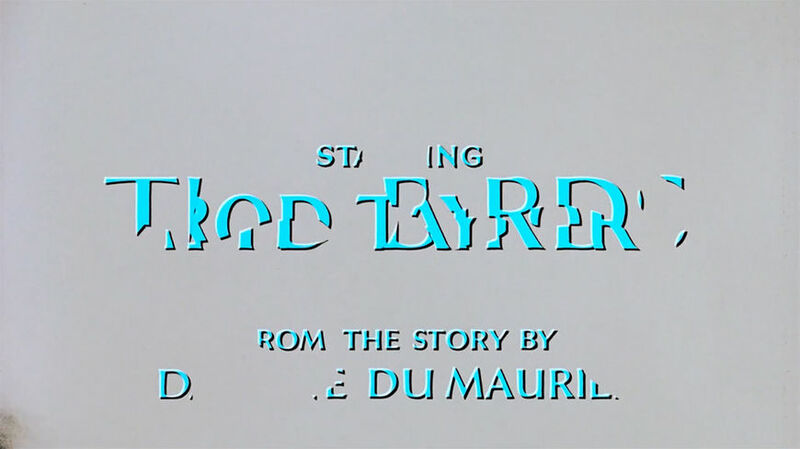 Notably, there is no music in the title sequence of The Birds. In fact, there is no musical score for the film at all – only diegetic sound and the real and electronic noise of birds. Time Magazine described the noise in the opening titles as a "shrieking din" while the Los Angeles Times' film critic likened it to something that "scratches you like a fingernail across glass." 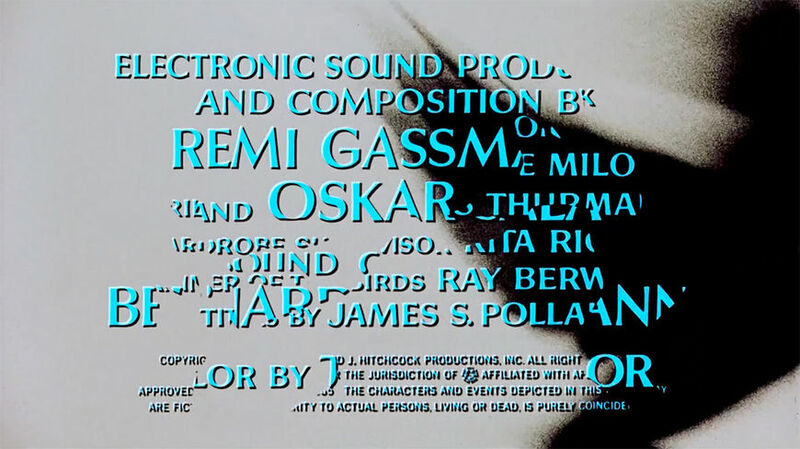 Paglia describes it (while also introducing its creators), saying, "The only sounds during the credits are the busy flap and flutter of wings, accompanied by raspy, echoing bird cries that subside and then burst out again at the names of the German composers of the pioneering electronic soundtrack, Remi Gassmann and Oskar Sala, with that of Bernard Herrmann, Hitchcock's brilliant musical collaborator, who supervised the sound effects." 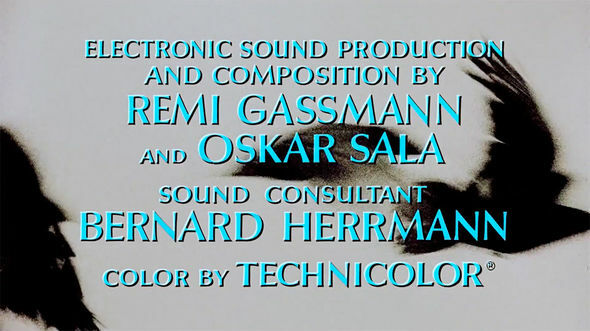 These electronic noises were generated by Gassmann and Sala using a Mixtur-Trautonium, an instrument that looks like a cross between a telephone switchboard and a Hammond organ. In the Margaret Herrick Library in Beverly Hills, California, there is a thick file dated 23 October, 1962 and labelled "Mr. Hitchcock’s Notes: Background Sounds for The Birds." It’s chock-full of detail regarding the electronic bird sounds generated by Remi Gassmann and Oskar Sala, the types of sounds desired, and the psychological effect intended. Elisabeth Weis, professor of film and the author of two books centered on sound use in film, published an article in Film Comment in 1978 entitled "The Sound of One Wing Flapping". 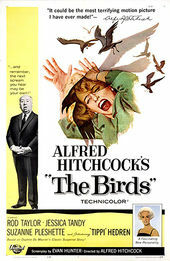 Weis writes: “The Birds' great reliance on sound effects is not only an aesthetic strength but a logical outgrowth of Hitchcock’s creative development". Diving deeper into the film, she places sound above image in terms of its hold on the psyche, saying that "screeches are even more important than the visuals for terrorizing the audience". This is because the nature of the sounds is artificial and so their aural texture is unsettling. Weis reasons that the avian noises are effecting because they "directly touch the fears of the audience" in a way that is "relatively abstract - especially the bird cries." Indeed, if there was no on-screen element to support the sounds directly, they may not register to the ear as relating to birds at all. "We sat alone in the screening room, side by side, Hitch and I, watching the opening credits of the film. He had decided by then that there would be no score for The Birds. Unmindful of his artistic pretensions for the film, I told him I thought that would be a mistake; that music could subtly foreshadow dire events to come or stridently accompany bird attacks until we had the audience screaming. He said no. No music. The titles had no music behind them. The screen was filled with fuzzy images of flying birds. There was the sound of wings whirring. There was the sound of birds squeaking and eeking. It was all very scary and portentous. Maybe he was right." 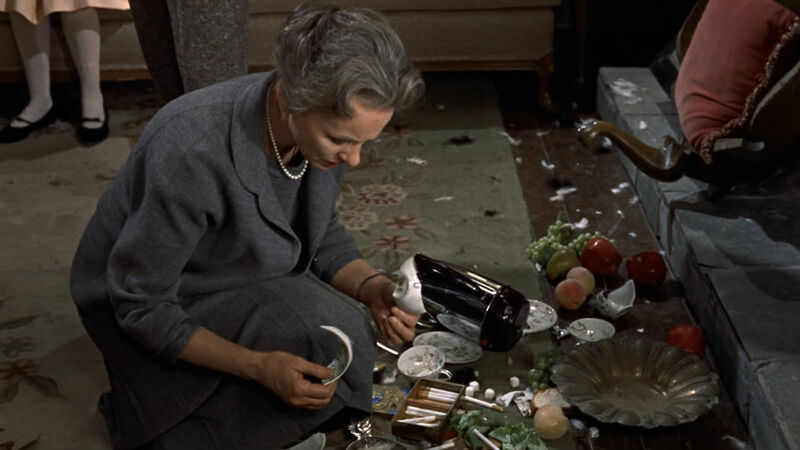 Choosing to forego music is just one of many omissions in The Birds that steers viewers’ experiences toward the unknown. The film occupies a space of pure symbol where the meanings of the birds and each character and event are interlaced, allowing for infinite readings. Another omission can be noted at the end of the film. 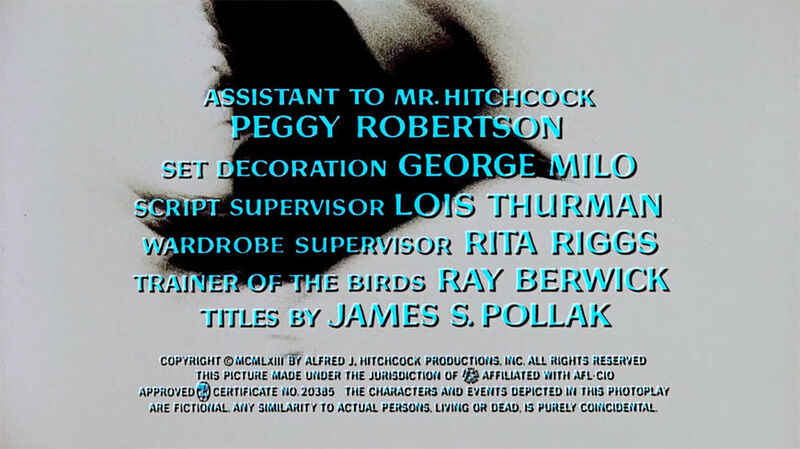 On January 11th, 1963 Peggy Robertson sent another memo to the National Screen Service, this time detailing Hitchcock's requirements for the end title card: there was to be none. With no "THE END" card, some members of preview audiences did not understand the film was over – they assumed that the film had broken down or the projector malfunctioned. This was a calculated move on the part of Hitchcock, who wanted the emotions of the film to feel endless. With no clear demarcation of the end, the terror could stretch on, the viewer left to decide what comes next. THEY SHOOT BIRDS, DON'T THEY? And what of the real stars of the picture, the live birds captured and trained by Ray Berwick and John "Bud" Cardos? Well, they got their revenge on Hitch. Assistant Editor Bud Hoffman described what happened after filming wrapped: "Some of the birds escaped and are now populating the San Fernando Valley. About 50 of the crows decided they liked it at Universal and made a perch on the tree outside Hitchcock’s bungalow, where they proceeded to go to the bathroom all over his car." The crew threw rocks at them and considered shooting them down. A crew was sent out to spray repellent to no avail. Finally, says Hoffman, they "solved the problem nonviolently by cutting off the tree limbs they were roosting on" and the birds took to the skies.